Hope your weekend is going well and whether it’s coffee, tea, or another favorite beverage, do savor the taste while you savor life – whether relaxing or going for it! ← Love – The Most Beautiful Gift! Savoring is the key word, be it life or coffee. Nice post. You are right, Indira, savoring is an excellent word especially when we practice it, as we can! It’s going to be my first superbowl and apart from the fact that I have no clue about the rules in American football I also can’t relate to a team, yet. Thank you dear Penny for the sensuous (correct term?) poem and have fun with the Seahawks playing! P.S. 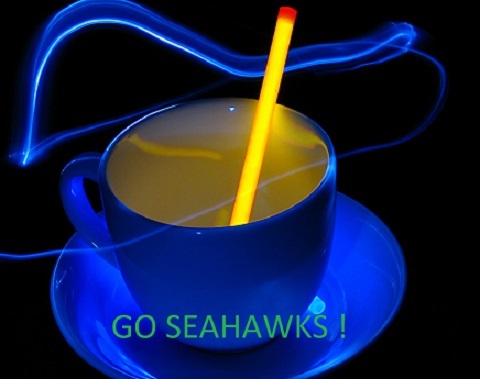 : Seahawks, yay! – Congratulations! Absolutely Steffi – A Huge YAY!!!! Thank you so much! If coffee was always presented like that it wouldn’t make me sleepy. I may do my best to watch the match tonight and then wonder just what is going on. We’re not going to be watching. In our household – once our team is out – we don’t watch. But – I do have a preference & with this post – there goes another reason for me to root for the Seahawks. If (when) they win – this will be their first BIG win! And – you are a fan! I cannot get going in the morning without my cuppa! Yes, go Seahawks! Penny I had this beautiful Chai Latte today in a nearby coffee shop , that is bliss, even better than tea and coffee for an evening after work. It is like going into another world for a while! Beautiful to relax. This way I started my week really lovely ! Sending you love and a good week too! super bowl? tomorrow night? ummm, who’s playing? your post is the first hint of who’s playing! care to bring me up to date and then what colors i should wear tomorrow evening?!!!! Hi Lisa, glad to be of aid. My son is actually the “Football” knowledgeable go-to guy, but he lives with his family back East so you’ll have to settle for me! The Seattle SeaHawk’s (from Washington State, so of course I’m cheering for them) primary colors are navy blue and all sorts of neon green trim ( Accessories, Decals etc.) secondary colors – silver and white! The other team is the Denver Bronco’s (another Northwest team this year). Their colors are orange, royal blue and white! Both excellent teams. Either one could win the Super Bowl! As far as the colors go I think the Seahawk’s are snazzier! thanks! so if i buy a shirt that has both blues, i’ll be totally neutral! He says two more – Go Seahawks!!!!! Go Coffee!! Love my #JavaFix ! !